In this article you will learn how to create a letter for mailing on the Wilda online builder. What is the difference between the Html and Jpeg formats? And which format is going to suit you more? We all use e-mail and often receive beautifully designed e-mails containing not only text, but also still images, logos, colored backgrounds and other design elements. 2. Send the jpeg image in the body of the e-mail. Let's focus on each variant in more detail below,and now begin with what a Html mail is and the features of its design. What is a Html mail? A Html mail is a document that is generated in Html language (the same as websites on the Internet). If you do not have sufficient skills, you will not be able to create this type of mail by yourself. You are going to need a help of professional coders and provide them with all of your materials: texts, images, the structure of the mail etc. After creating a html mail, you will need some special software to send it out to the recipients. There are quite a lot services that allow you to create your own e-mail using templates with a Html-editor before sending it out. The disadvantage of this approach is that it may be incorrectly displayed for some recipients, because these types of editors may generate extra code, or templates could be not enough adapted to different email programs that collect and send mail, such as Gmail, Outlook, Thunderbird or the Bat. The same problem exists when displaying Html mails on mobile devices. After all, a html mail is similar to a website page, which should be adapted to different devices. In addition, when creating a mail, you must take into account the limitations on the use of the fonts. Your recipient might not have the font you have chosen for your design on their computer, so it will be replaced by one of the most common fonts ( like Arial) and won't be displayed as you had intended! Conclusion: creating a Html newsletter is not so easy and you really cannot do it without the help of a professional coder or some special software. But even then, this does not guarantee that it will be displayed in the same way on different devices. How can Wilda help you? To do this, select the "E-mail letter" type when creating a new document or use the appropriate template. The width of the document will be 700 px – the recommended value for the successful display of the mail on mobile devices, whilst you can adjust the height depending on the content. After editing, simply save your email as a Jpeg file. The image, created on the Wilda online builder. You need to send small single-screen information mails, such as postcards and greetings, information about a change of address or office, a banner about the start of a sales period for a product or service, etc. You have one link in your e-mail. In any e-mail program, you can attach one link to your image. However, if necessary, you can always add some text to the image, which you are able to add links too as well! You want to use some creative or branded fonts, as the Html set of fonts are clearly regulated and limited. In addition, thanks to the Publishing service, your letter will have a web version. It serves to ensure that recipients who do not have an image displayed, can go to the web version and read the content. Sample of the E-mail letter web version. To create a web version of your email, you just need to publish your letter on Wilda and it will have its own url address on the network. If you still need a Html letter, you can use the Wilda builder to create a mail layout which makes it easier for professionals to understand what you need. After you publish your layout on our service, your coder will be able to take everything they needs (texts, images, icons, logo etc) from your published layout. In any Html mail there are a necessary set of elements: a Header, a Footer , a background or images. With Wilda you can create or edit these elements, saving each one individually as a Jpeg file. To do this, the Wilda editor provides the creation of documents of all sizes. Check with your specialist about the necessary requirements for the elements and create them on the editor. You can easily cope with this task, especially if you have already made some of your own documents. At the same time, the Wilda editor will have already stored your logos, images, brand colors, etc. Summing up all of the above, the Wilda online builder will certainly be useful to anyone who needs to create a beautiful and effective e-mail text. If you need help, you can always contact our designers. 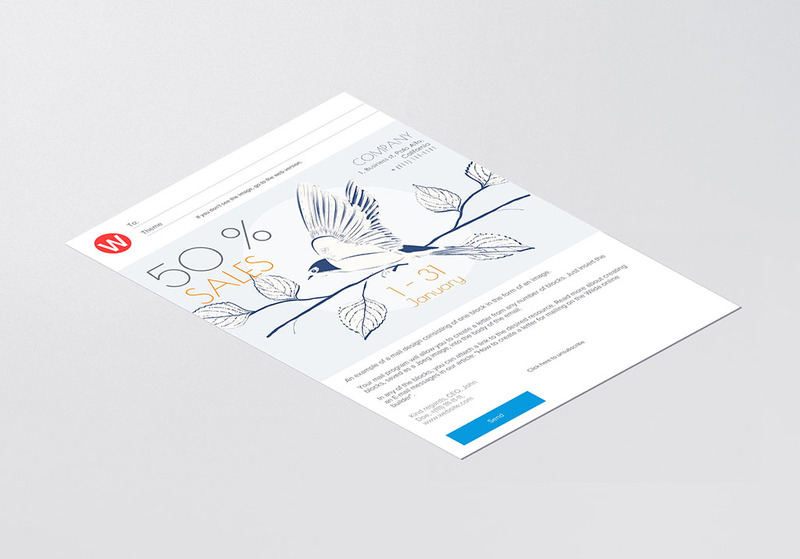 Read more about the design of emails in the article "How to create a well constructed e-mail".